Customers must find value in what you’re sending. Obvious? Probably. But let me explain further. A brand-new user to your mobile app will not hit the “Allow Notifications” button unless they know what information they’re signing up for. And while channels like email or web push optimize for a user experience inside a web browser, mobile users are…a little more distracted. So with all these factors against us, how do you, the growth marketer, implement a successful mobile push messaging program? As a reminder, I mentioned that the one principle of a successful mobile push program is sending valuable messages to the user. So while you have a metric you’re trying to optimize for, always keep in mind that your brand—whether it’s product or service-based—must give users and customers information that will improve the outcome of their everyday lives. To persuade users even to allow you the opportunity to send mobile push notifications to your phone, you must start with the principle of reciprocity. Meaningful and unexpected. Example: A waiter offering a complimentary dessert at the end of a meal, even after the diners had already opted out of ordering dessert. Customized. Example: Offering a Starbucks gift card to an employee who doesn’t drink coffee isn’t nearly as persuasive as offering it to someone who gets a cup of Joe every morning. So how does this relate to mobile push messaging? Need some examples to inspire you? 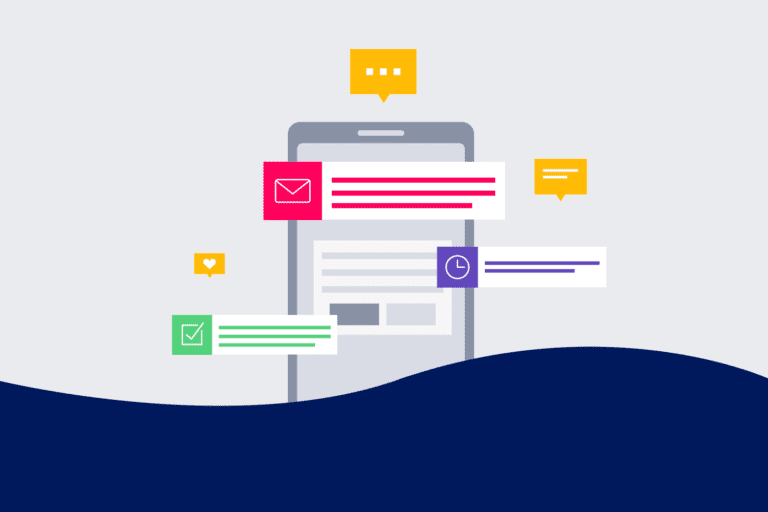 Here are four different businesses who use mobile push messaging to grow their brand, based on Cialdini’s principle of reciprocity. As Neil Patel says, parents-to-be can’t stop obsessing over their unborn child—which is why mobile push messaging on The Bump is so successful. I didn’t believe this until I got pregnant myself and downloaded the app so I could make sense of all the weird stuff happening with my body. Just by asking for my due date, they can send me customized content every week about my symptoms, what to expect, and as well as provide me with lifestyle planning tips. 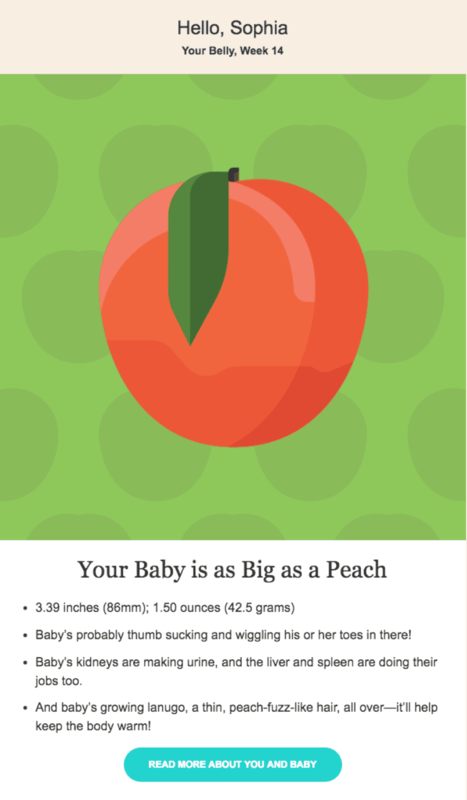 For the mobile push message, it’s a simple message at the 14th week, letting me know that my baby is approximately the size of a peach (with a fun emoji to catch my attention). Note: The Bump is not an Iterable customer. Whereas the email is more detailed, offering me progress on how much my baby has grown and what developmental stage they’re in. 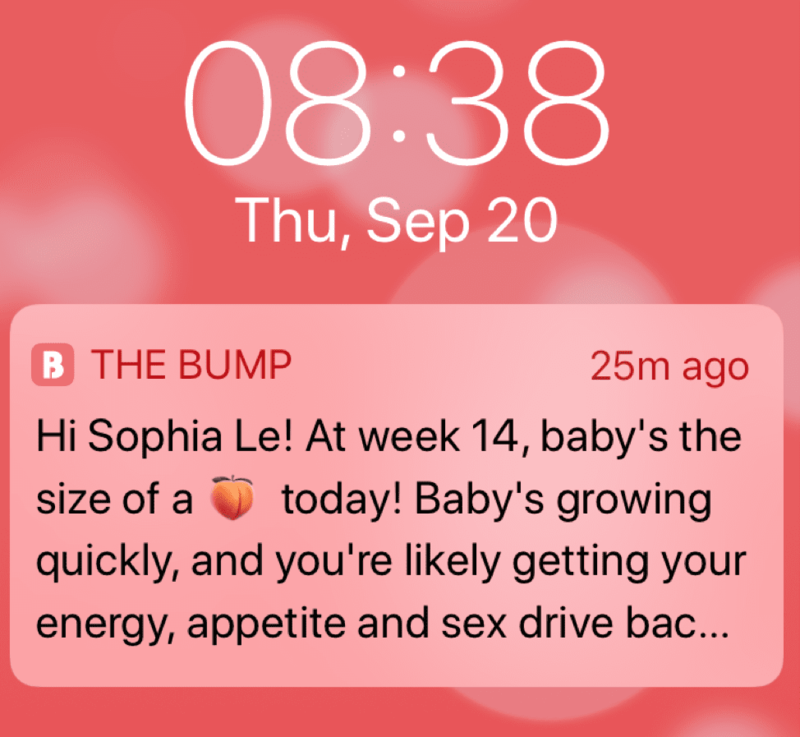 Subscribers of The Bump can receive more detailed pregnancy information via email. To coordinate mobile push and email messaging better, The Bump could allow email to work in tandem with mobile push and offer a call-to-action at the footer to decide whether the mom-to-be wants personalized alerts in her inbox or on her phone. But as a user of the app, I don’t mind that I’m being sent both email and push notifications. Mainly because the messaging is meaningful to my state of mind, thoughtful, as well as customized to my baby’s development. Traveling is stressful, but knowing real-time information about your flight can make it all better. Alaska Airlines knows this better than anyone else, which is why their mobile app is so nice to travel with. So here’s what happened when I flew from San Jose to Seattle a few weeks ago. 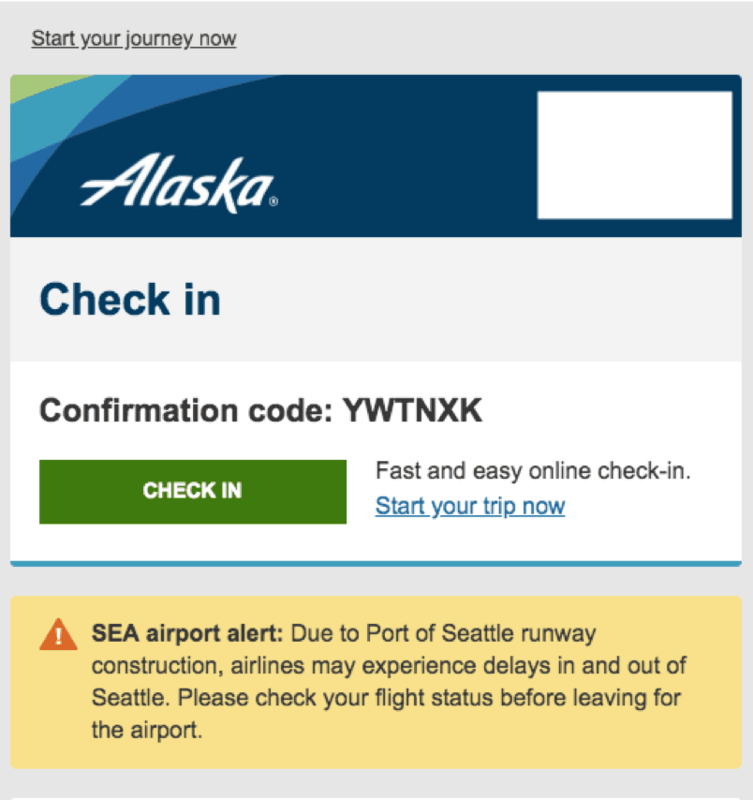 Alaska sent me an email reminder to check-in for my flight 24 hours before I took off, and gave me information about what’s happening that may affect the timing of my flight. Note: Alaska Airlines is not an Iterable customer. In my case, SeaTac is undergoing construction on one of their three runways, so delays are possible. But Alaska lets you know that right up front. Plus, as your trip gets closer, Alaska’s app reminds you of your flight time, just in case you end up searching your email inbox a billion times before you get on a plane (at least I do). And if you happen to be getting coffee or in the bathroom, Alaska gives you notification of when your flight is boarding. Alaska Airlines keeps customers updated with real-time flight information via mobile push. To further enhance their mobile push messaging, Alaska could nudge new users to download the mobile app to make flight purchases. 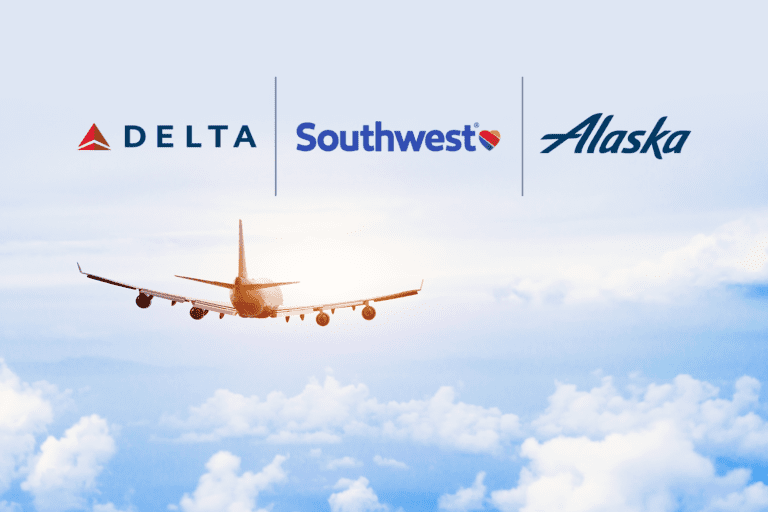 Based on Iterable’s latest User Engagement Teardown on the top U.S. airlines, Alaska primarily used email to onboard new users and neglected to use other types of messaging. 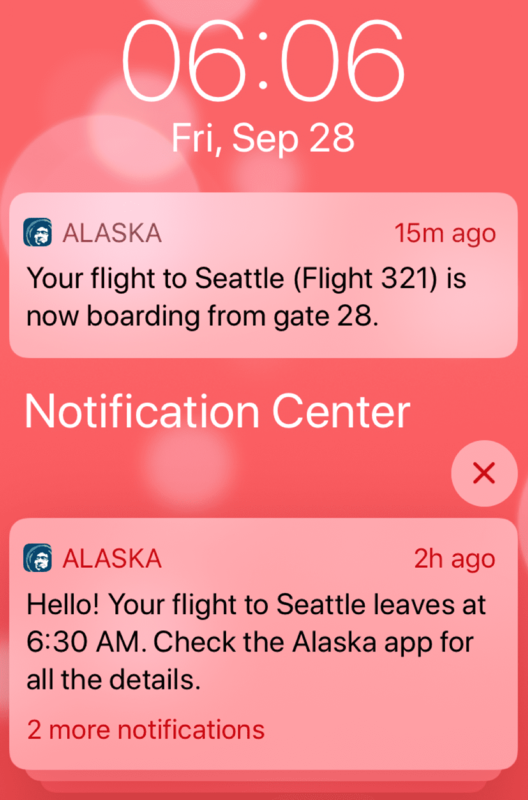 However, Alaska has clearly thought about what their current customers want when they travel, and it reflects in their mobile app and their push messaging strategy. The goal at Starbucks is simple—get customers to buy more coffee. But Starbucks gets most of its traffic during the morning and early afternoon—meaning that between 3:00-6:00 p.m., not as many customers want coffee. So how do you keep the momentum going even in the afternoons? 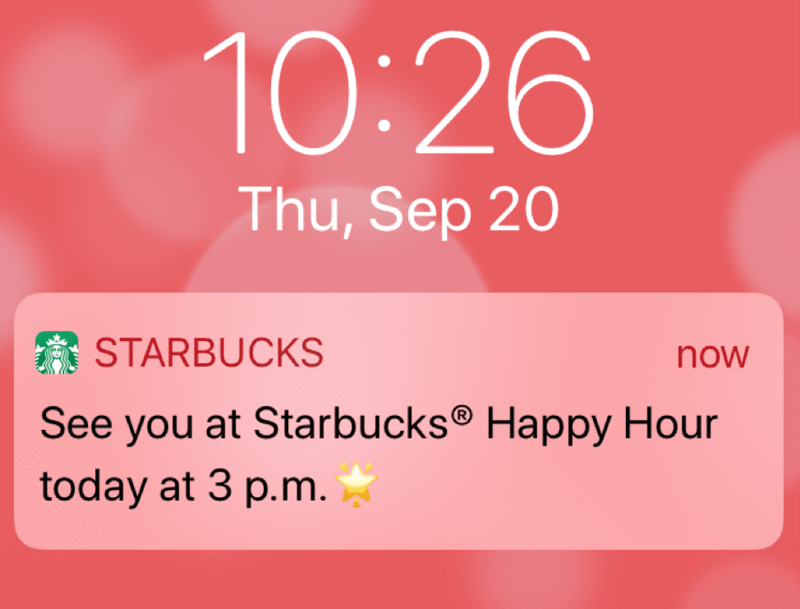 Starbucks has been offering happy hour to customers for years now, but with email and mobile push, it’s never been easier to remind caffeine addicts that they can get 50% off a drink if they come back in the afternoon every Thursday. 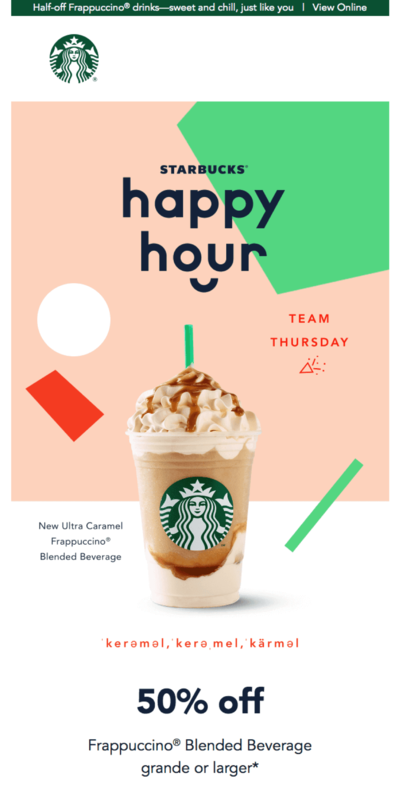 First with email, showing me that I can get a refreshing blended Frappuccino for 50% off. And then in case I forget, I also get a friendly reminder via mobile push about when happy hour starts. Note: Starbucks is not an Iterable customer. This is a great offer, since who doesn’t love getting coffee at 50% off? But I will admit—I didn’t purchase a drink because I know happy hour happens every week. If Starbucks wanted to take it a step further, they could personalize the customer’s favorite drink order in their messaging. But if Starbucks’ only goal is to entice people every Thursday afternoon, then this strategy works. Lastly, it’d be hard to mention mobile push messaging without mentioning Iterable customer SeatGeek. 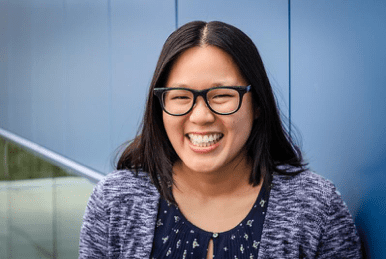 SeatGeek’s mission is to make sure you get the best ticket prices on the events you want to go to—even if it’s obscure and hard-to-track-down. 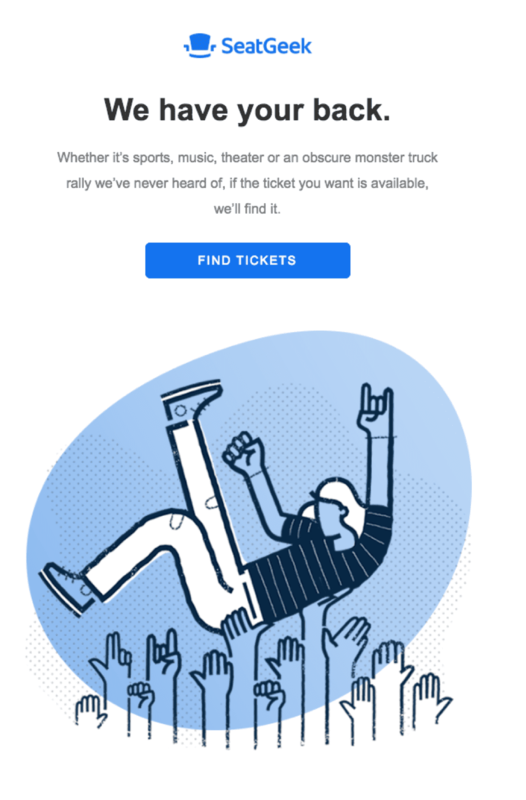 SeatGeek uses email to recommend tickets based on customer preferences. Once you download the SeatGeek mobile app, you’re asked to connect to an Apple Music Library, Spotify, Facebook, or Last.fm account so that SeatGeek can give you information about events based on your listening habits or interests. 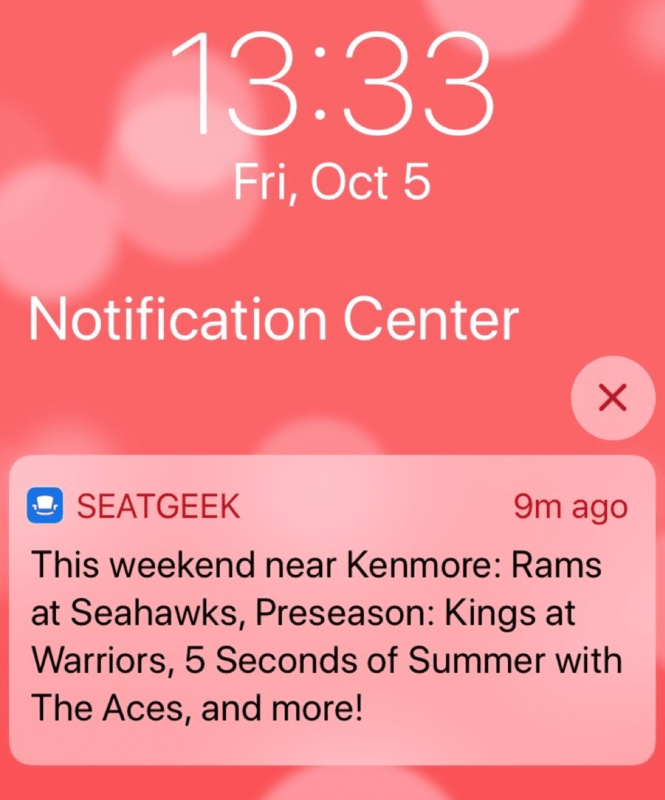 I connected my Spotify account, and based on my music interests and my location (Kenmore, WA), SeatGeek knows exactly which events might be interesting to me this weekend. SeatGeek personalizes its mobile push messages by location and user interests. Show the right deal at the right time (especially before events disappear). They provide valuable information to their customers. 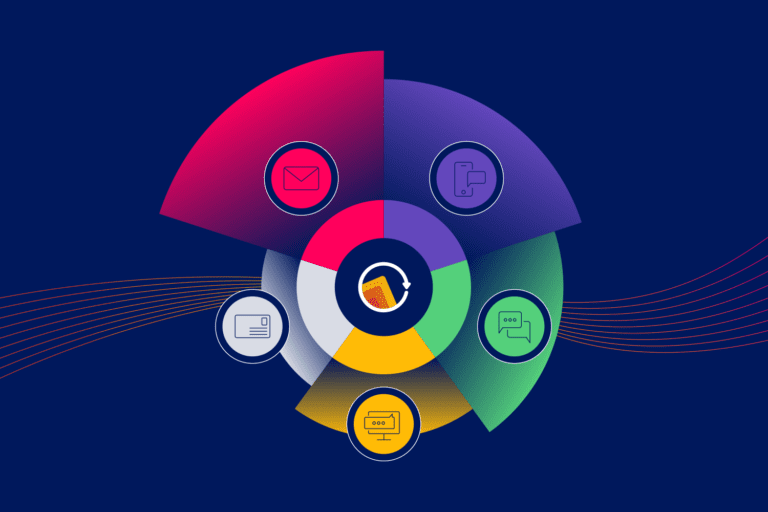 Additionally, all of the brands supplement mobile push messaging with email marketing, which can help strengthen the effectiveness of your offer. Keep these rules in mind, and there’s no reason your brand can’t implement a robust mobile push messaging program.